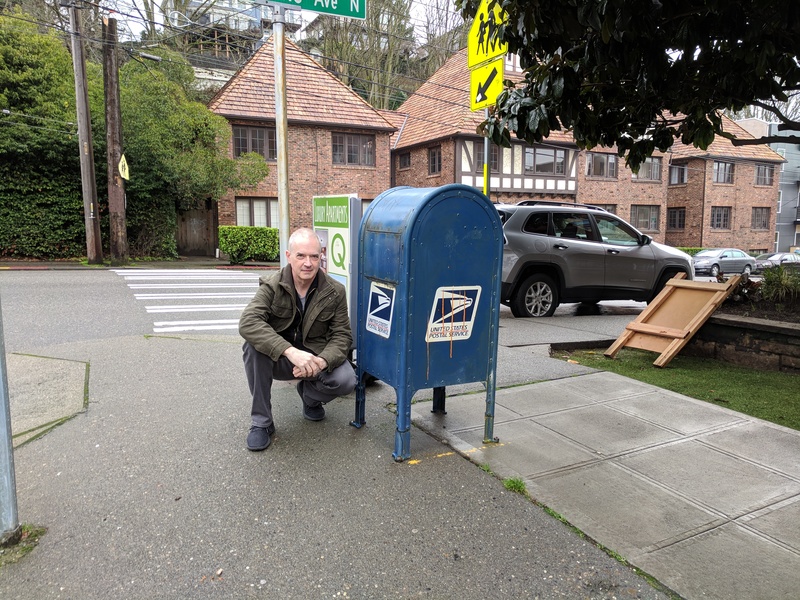 326) Queen Anne Five-Pack (5/5)  We continue our exciting QA journey visiting FIVE untapped mailboxes! Here we are, at the last box on this mini-series. I’m crouched down because I had to park very illegally, and I wanted to be as stealth as possible. 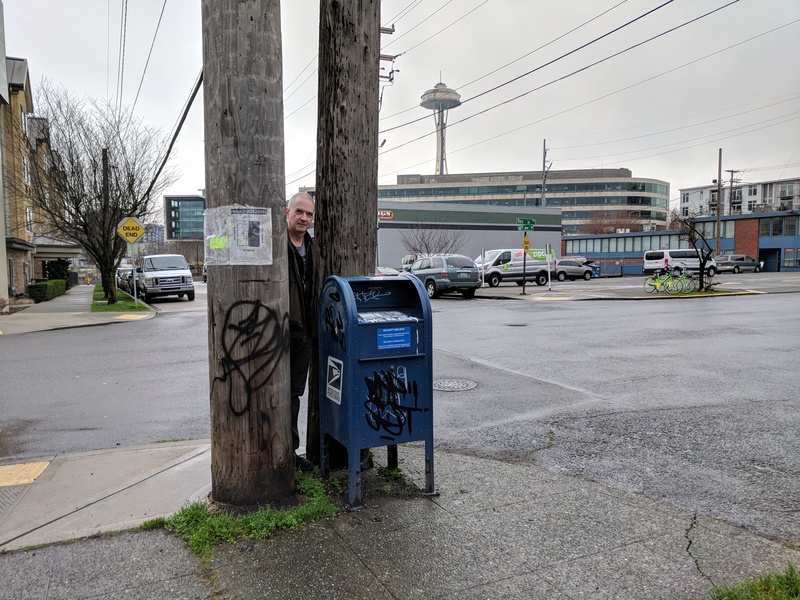 Since most mailboxes are dutiful civil servants, I knew there was a risk of this guy reporting me, so I slinked in, got the shot, and slinked out. I don’t think he ever noticed. I hope you enjoyed this absolutely thrilling Queen Anne series! We’ll return to our regular programming tomorrow. 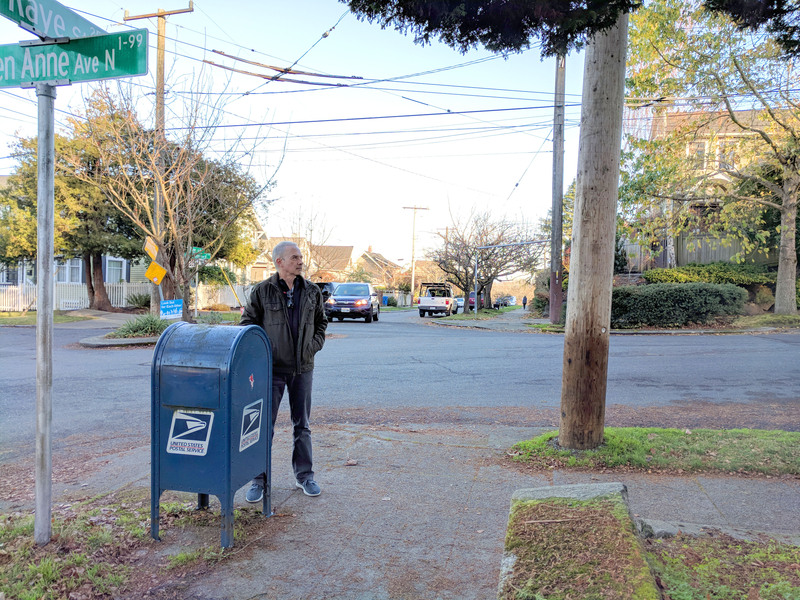 324) Queen Anne Five-Pack (3/5)  We continue our exciting QA journey visiting FIVE untapped mailboxes! We turn onto Queen Anne Ave and begin the climb up the counterbalance. At this first stop, I wanted the photo to convey some sense of the steepness of the hill, and as you can see I failed miserably. 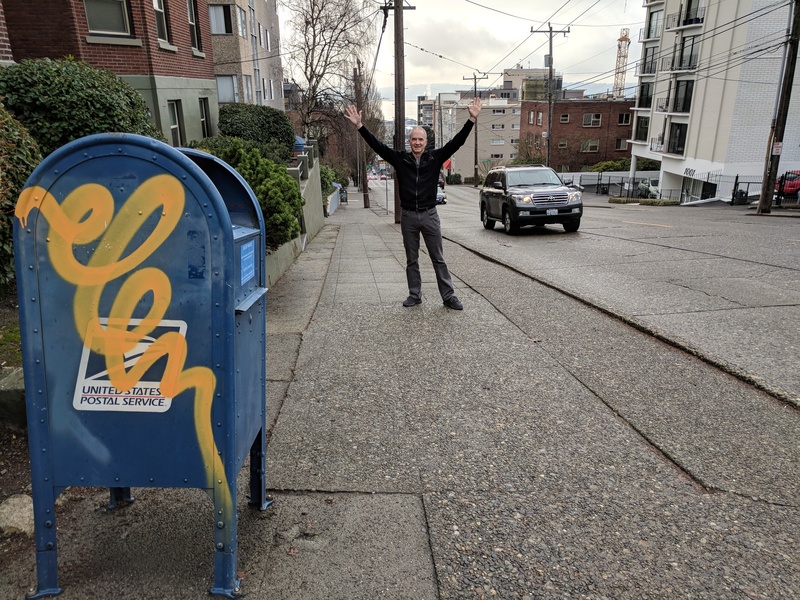 If you live in Seattle, you already know this is a steep hill; if you don’t live here, I guess you’ll just have to trust me that it’s steep. 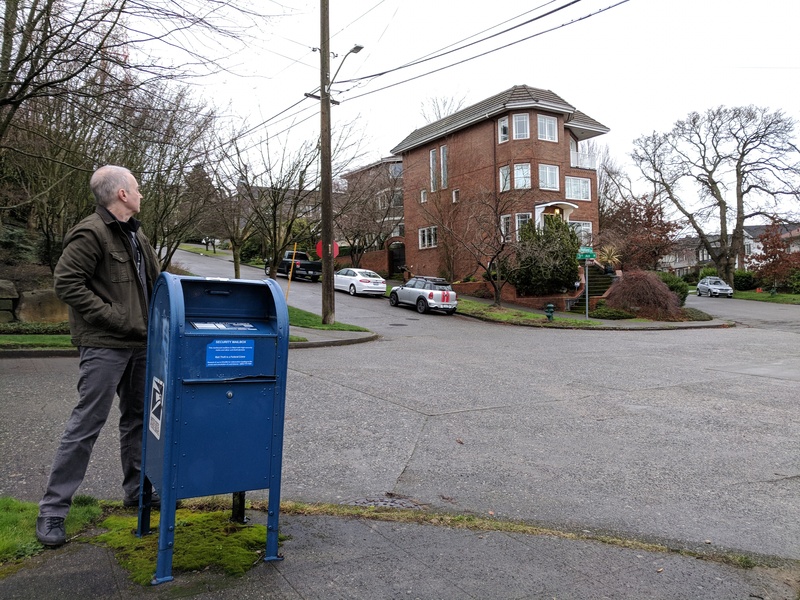 323) Queen Anne Five-Pack (2/5)  We continue our exciting series of a cluster of FIVE untapped mailboxes along a QA route! 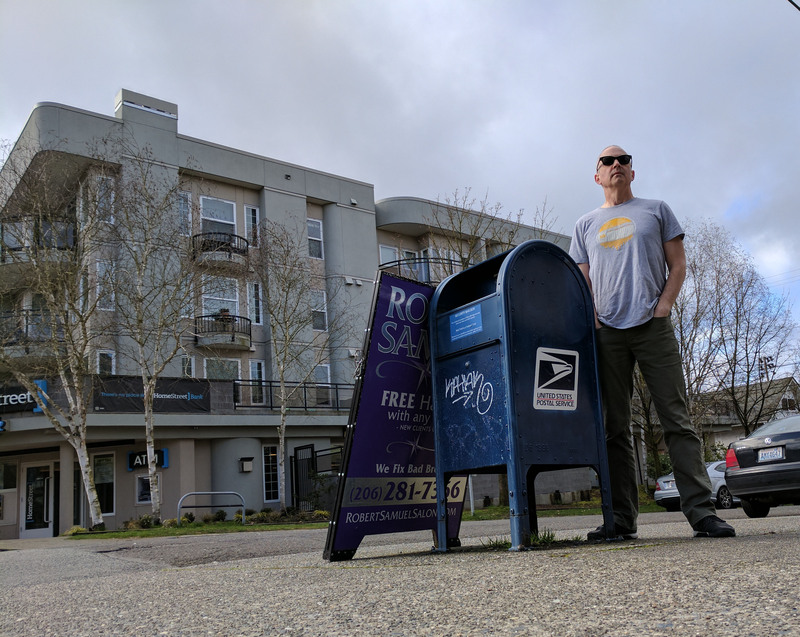 The next box is just a couple blocks up Roy. 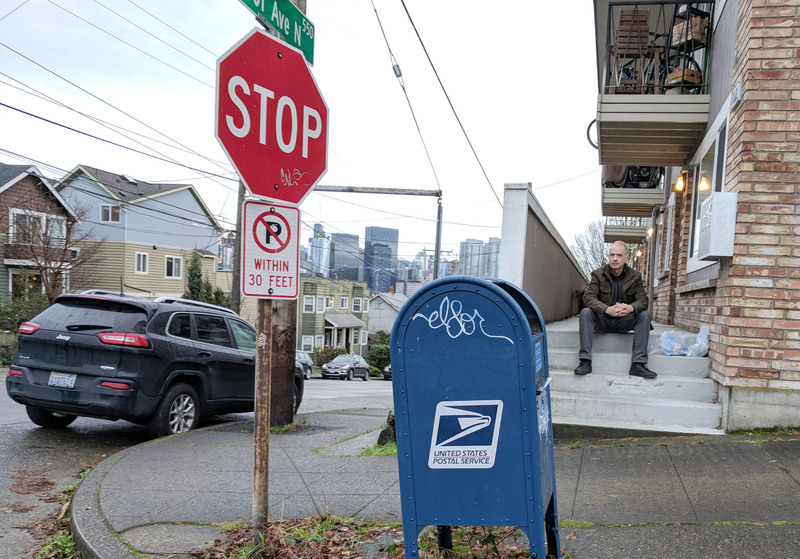 This box, in contrast, enjoys his view of the Space Needle and is looking forward to seeing it in its renovated glory. Unfortunately, however, it can only see the Needle when that tree is bare. The rest of the time it can only stare at that parking lot. 322) Queen Anne Five-Pack (1/5) — Exciting news! 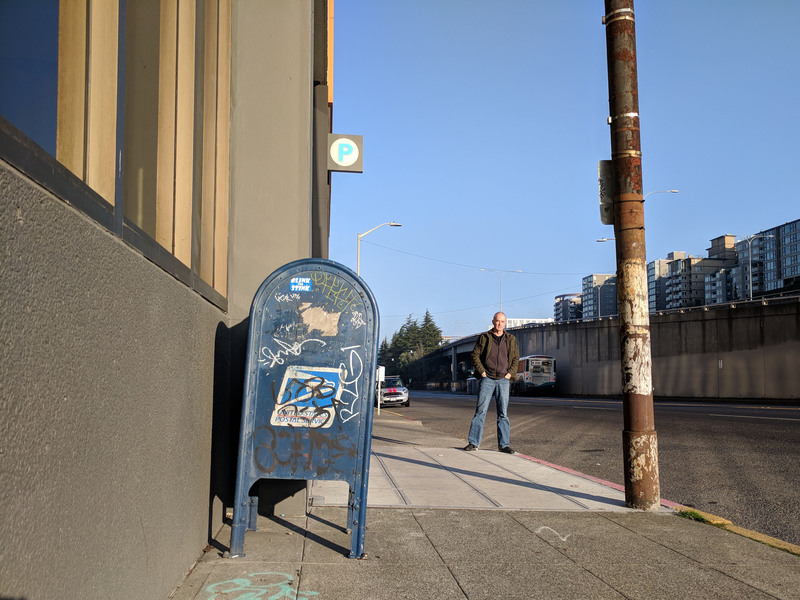 Yesterday, we were heading out on some errands and i realized there were FIVE untapped mailboxes on our route! Faithful readers know that when I encounter a cluster like that, I like to feature them in a series… so here we go! The first stop in this series finds us just off of Aurora. This box has backed himself up against two poles, but for what reason I don’t know. Did something bad happen across the street and he wants to be sheltered from any further activity? Is he just tired and needs something extra to lean on? Is he actually in the process of walling himself off from all of society and is actively recruiting new poles to join him? 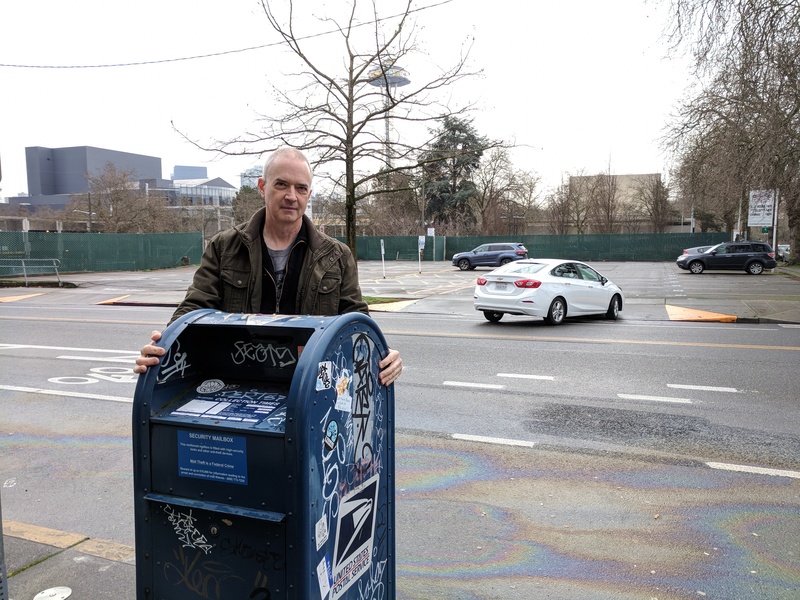 Or maybe he’s just upset that the Space Needle is getting a $100 million facelift but he can’t get anyone to clean the graffiti off of him. 292) I owe this box a huge apology. Why? Because I took this photo about seven months ago and kind of misplaced it. I feel just terrible. I told the mailbox to look for it to be posted “soon” and he was so excited. I think he even wrote to all his family to tell them to watch for it… they must have been so disappointed. 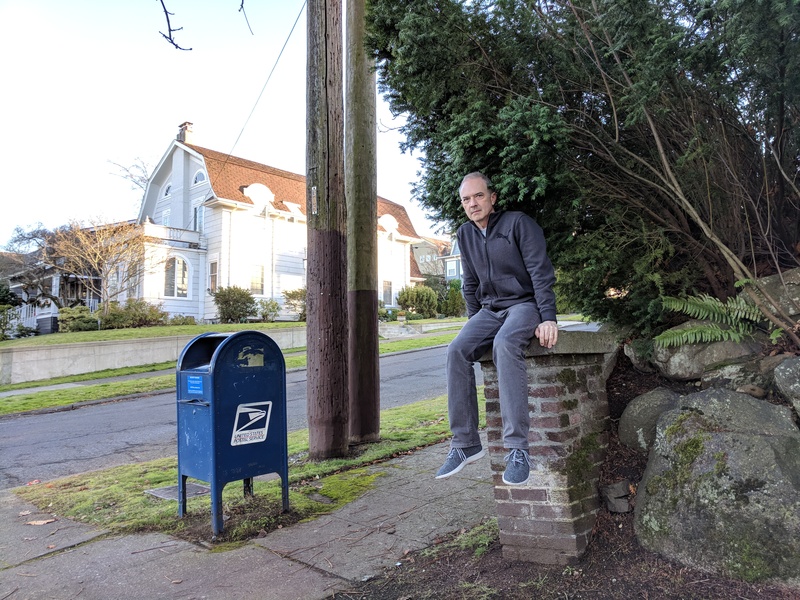 287) Either this photograph represents a class case of perspective, where objects appear to be false sizes due to their relative distance from the camera… or I have indeed shrunk to a size where I can easily fit inside a mailbox. I’m going to leave it to you to decide.